EFFECT OF SOME SEED TREATMENTS ON GERMINATION OF Sideritis perfoliata L.
The genus Sideritis L. belonging to Lamiaceae family is represented with more than 150 species worldwide.. The genus is represented in Turkey by 46 species and 53 taxon within two sections among which 39 are endemic. Endemism rate (79.5%) in Turkey is quite high because Turkey is one of the two major gene centers of the genus. Sideritis species are known among people with different local names such as mountain tea, highland tea, sage, sarıkız tea and tail tea. According to some recent researches, extracts obtained from Sideritis species were shown to have antistress, antiulcer, analgesic, antioxidant, antibacterial, anti-inflammatory and insecticidal effects. The interest in and the demand for this plant species has increased particularly due to its antioxidant effect. Seed germination studies of this species have great importance on determination of production strategies of medical and aromatic plants. This study was conducted to determine the effects of some pre-treatments (ethylene, gibberellin, mannitol, seaweed and cold pre-treatment) on germination of Sideritis perfoliata L. which is naturally grown in western Anatolia. The study was carried out at 25/15oC day/night temperature conditions. The experiments were performed according to completely randomized design with 3 replications at Adnan Menderes University, Faculty of Agriculture, Field Crops Laboratory. Significant differences were determined between applications with respect to germination rates and germination vigor values. Başer, K.H.C. 2002. Aromatic biodiversity among the flowering plant taxa of Turkey. Pure and Applied Chemistry, 74: 527-545. Baytop T.1999. Geçmişten Günümüze Türkiye'de Bitkilerle Tedavi, Nobel Tıp kitabevi, İstanbul. Come, D. 1970. Les obstacles a` la germination. Paris, France: Ed. Masson. Çarıkçı, S., Sağır, Z. & Kılıç, T. 2012. Türkiye için endemik iki Sideritis türünün mineral içerikleri, Tıbbi ve Aromatik Bitkiler Sempozyumu, 13-15 Eylül 2012, Tokat, bildiri kitabı, s 81-87. Demirkaya, M. 2006. Effects of Osmotic conditioning and Polyethylene Glycol applications on pepper seed germination rate and power. Erciyes Üniversitesi Fen Bi-limleri Enstitüsü Dergisi, 22 (1-2): 223-228. Ekim, T., Koyuncu, M., Vural, M., Duman, H., Aytaç, Z. & Adıgüzel, N. 2000. Turkey Red Book of Plants (Pteridophyta and Spermatophyta), Barışcan Ofset, Ankara. Ercişli, S., Eşitken, A. & Güleryüz, M. 1999. The effect of vitamines on the seed germination of apricots. Acta Horticulturae, 488: 437-440. Everest, A. & Öztürk, E. 2005. Focusing on the ethnobotanical uses of plants in Mersin and Adana provinces (Turkey). Journal of Ethnobiology and Ethnomedicine, 1: 6. Gonzales Burgos, E., Carretero, M.E. & Gomez-Serranillos, M.P. 2011. Sideritis ssp. Uses, chemical composition and pharmacological activities-A review. Journal of Ethnopharmacology, 135: 209-225. Göktürk, R.S. & Sümbül, H. 2002. The current conservation status of some endemic plants of Antalya province. The Karaca Arboretum Magazine, 6(3): 91-97. Gümüşçü, A., Gümüşçü, G., Tugay, O. & Kan, Y. 2011. Studies on Some Mountain Tea (Sideritis) Species on cultivation, IX. Turkey Field Crops Congress,12-15 September 2011 Bursa, 2: 1191-1196. Gümüşçü, A. 2014. Seed germination of some endemic Sideritis species under different treatments. Medicinal and Aromatic Plant Research Journal, 2(1): 1-5. Hartmann, H.T., Kester, D.E. & Davies, F.T. 1990. Plant Propagation. Principles of Propagation by Seed. 647 p.
Hilhorst, H.W.M. & Karssen, C.M. 1992. Seed dormancy and germination: The Role of absisic acid and gibberalins and the importance of hormone mutants. Plant Growth Regulation, 11: 225-238. Karakurt, H., Aslantaş, R. & Eşitken, A. 2010. Tohum Çimlenmesi ve Bitki BüyümesiÜzerinde etkili olan Çevresel faktörler ve Bazı ön Uygulamalar. Uludağ Üniversitesi Ziraat Fakültesi Dergisi, 24(2): 115-128. Kozuharova, E. 2009. New Ex Situ Collection of Rare and Threatened Medicinal Plants in the Pirin Mts. (Bulgaria). Ecology, 18(72):32-44. Kırımer, N., Tabanca, N., Tümen, G., Duman, H.G. & Başer, K.H.C. 1999. Composition of Essential Oil of Four Endemic Sideritis Species from Turkey. Flavour and Fragrance, 14: 421. Özcan İ. İ., Bazı Adaçayı Türlerinde Farklı Tohum Çimlendirme Uygulamalarının Belirlenmesi. Adnan Menderes Üniversitesi, Ziraat Fakültesi, Tarla Bitkileri Bölümü, 09100 Aydın. Özgüven, M., Sekin, S., Gürbüz, B., Şekeroğlu, N., Ayanoğlu, F., Ekren, S., 2005. Tütün, Tıbbi ve Aromatik Bitkiler Üretimi ve Ticareti, IV. Türkiye Ziraat Mühen-disliği Teknik Kongresi, Ankara. Öz, S. 1999. Balıkesir Edremit Kazdağı yöresinde yetişen Sideritis türlerinde kromozom çalışmaları (S. perfoliata L., S. athoa Papanikolcu & Kokkini, S. dichotoma Huter, S. trojona Bornm.) Balıkesir Üniversitesi Fen Bilimleri Enstitüsü, Yüksek Lisans Tezi. Özkum, D. 2006. Kekik (Origanum minutiflorum) ve adaçayı (Sideritis stricta)’nın doku kültürü yoluyla çoğaltımı üzerinde araştırmalar. Hacettepe Üniversitesi Fen Bilimleri Enstitüsü, Doktora Tezi. Şenel, E. 2005. Bazı Endemik Bitki Tohumlarının Çimlenme Şartlarının ve Toplam Fenolik Madde İçeriklerinin Belirlenmesi Üzerine Araştırma, Ondokuz Mayıs Üniversitesi, Fen Bilimleri Enstitüsü Yüksek Lisans Tezi, Samsun 52s. Thanos C.A. & Doussi M.A. 1995. Ecophysiology of seed germination in endemic Labiates of Crete. Israel Journal of Plant Sciences, 43:227-237. Tuğrul Ay, S., Tanrıseven, M., Çınar, O., Demiray, K. & Ayas, F. 2012. Antalya florasında doğadan toplanan ve kültüre alınan Sideritis stricta türünün kalite özelliklerinin belirlenmesi, Tıbbi ve Aromatik Bitkiler Sempozyu-mu, 13-15 Eylül 2012, Tokat, bildiri kitabı, 260-264. Uçar, E. & Turgut, K. 2009. In Vitro Propagation of Some Mountain Tea (Sideritis) Species. Akdeniz University Journal of the Faculty of Agriculture, 22(1): 51-57. Yamaguchi, S. & Kamiya, Y. 2002. Gibberalins and light-stimulated seed germination. Journal of Plant Growth Regulation, 20: 369-376. ISNAD ARABACI, Olcay , YAŞAR, Feride , ÖĞRETMEN, Neval Gül , TAN, Uğur . "EFFECT OF SOME SEED TREATMENTS ON GERMINATION OF Sideritis perfoliata L.". 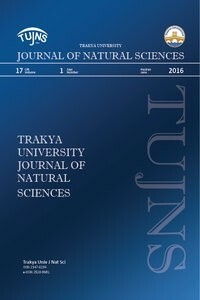 Trakya University Journal of Natural Sciences 15 / 2 (January 2016): 83-87.